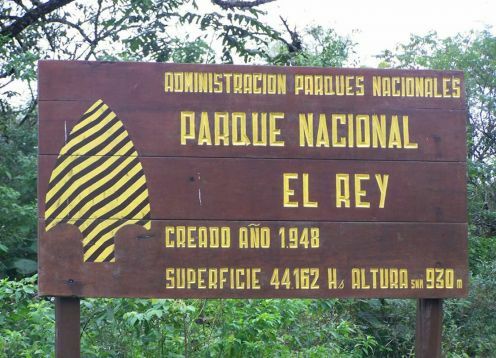 The El Rey National Park is located about 200 kilometers east of the city of Salta capital and was created on June 24, 1948. It has an area of ​​44,162 hectares containing samples from the ecoregions of Yungas and Chaco Seco. It forms part of the Subandinas mountain ranges, in the area of ​​the tropical forest. It has a tropical climate with average temperatures that range between 22 and 25 ° C. Rainfall reaches 2000 mm per year. Flora: The jungle is distributed in different floors or strata as the height increases. The lowest corresponds to the Chaco mountain forest with species such as the horco quebracho, the cochucho, the atamisque and the cardones. Then begins the transition forest with tipas and pacaraés, followed by the montane forest with large specimens of cedar, tarco, tipa and walnut. Fauna: The fauna is varied with birds such as the red-legged chua, the charata and the common turkey, and also brown and red corzuelas, peccaries, river wolves, tapirs, foxes and pumas. The rivers and streams are populated by several native fish such as dorados, bogas, catfish and tarpons. In the Lagoon of the Ducklings, diverse aquatic birds inhabit: the gallareta escudete red, the black pollona, ​​the duck cutirí and the gray macacito. By car: From the cities of Salta and San Miguel de Tucumán, by National Route No. 9 to Lumbreras, Provincial Route No. 5 to Paso de la Cruz, and Provincial Route No. 20 to the entrance of the park, 197 and 387 km respectively.